What is Rekey? When to rekey a Lock? Rekeying basically refers to a process performed by a professional locksmith to render the original keys of a lock inoperative. It usually involves changing the configuration of the lock so a new key can function while the previous one will not. This configuration involves handling a series of tumbler pins that will ensure a lock can be opened with only the correct key. When should you rekey a Lock? When you change nannies, cleaning companies or other helpers in your home, rekeying your lock may be necessary for your security. As soon as your former roommate leaves your home, rekey the locks. The person may have given a few copies of the key to friends or they may have forgotten to return the key. When your key is lost or stolen, the security of the home has been compromised as just anyone could have access to it. In localities where a single construction company serves as contractor for all the homes in the area, the locks may be keyed in such a way that it can be accessed using a master key. This could compromise the security of your home after the project. In most cases, people often think that an entire lock change may be a better alternative for their peace of mind. But this is not necessarily the case. So long as the door lock is still functioning properly, it can still be rekeyed instead of totally replacing the lock. Rekeying it makes any previous key inoperative and prevents unauthorized access to your home. 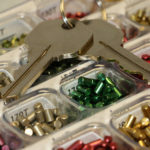 Rekeying is an especially viable option as it is often less expensive and does not demand as much labor as an entire lock replacement would demand. Not only is rekeying your lock an affordable and less laborious option, it is also a great option for property owners, realtors, and managers looking for control of their home and the peace of mind that comes with security. If you think the security of your home may have been compromised, it would be ideal to speak with a professional locksmith as soon as possible. At Bellevue Locksmith, we offer professional rekey services for all key types – including commercial and residential locks. Our dedication to service to customers in Bellevue ensures you can contact us at any time and rest assured, our experienced locksmiths will arrive your property within minutes. We are a service you can count on – our locksmiths spread the entire Bellevue area and can get to you at any time as we are open 24 hours a day, 7 days a week. Feel free to contact us at [email protected] or call us at (425) 209-0056 – we look forward to working with you.